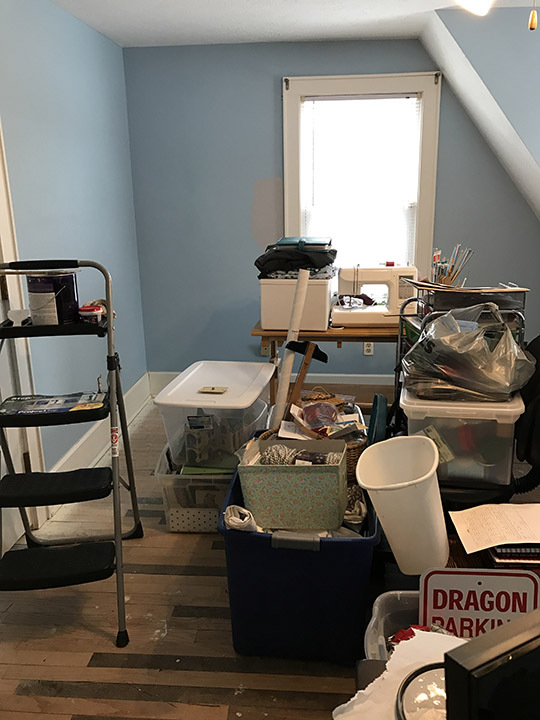 I can see my sewing machine, way back behind that ginormous pile o' stuff. I just can't get to it. And I can't find my rotary cutter, or my quilt ruler or my good scissors... That's what I get for deciding to remodel my sewing room in the middle of December, in and around all the holiday craziness. I'm hoping it will be put back together with new bookshelves and freshly painted walls in the next week or so, but in the meantime I had to find a non-sewing way to indulge my creative side. And since poor planning on my part is what created this mess in the first place, I decided to design some printables to help me get my planning act together for the new year. 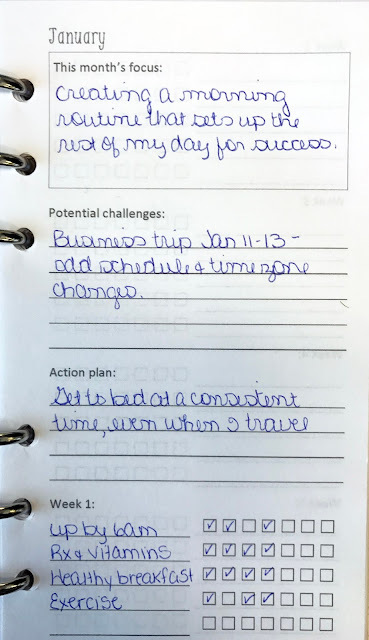 Last year I set three big personal goals and, while I made progress on all of them, I didn't accomplish any of them because I didn't break them into small enough action items. 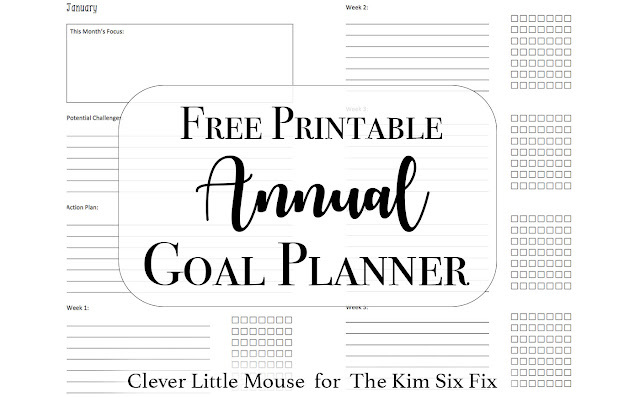 This year, I decided to pick one thing to focus on each month, make a mini action plan, and give myself some trackable things to do every day to help me accomplish that goal. I love my paper planner(s). 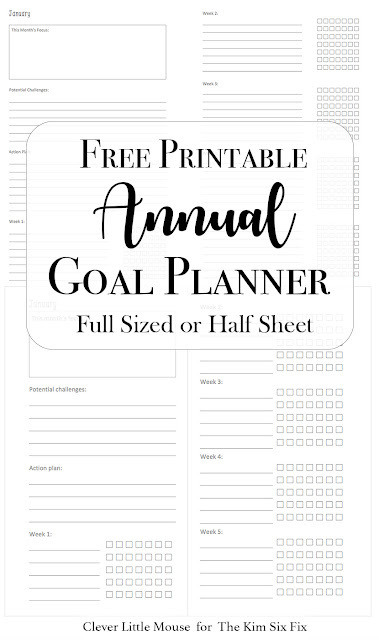 I have a couple that I rotate through depending on how crazy my life is at any given moment, so I made the same monthly goal tracker to fit a personal size Filofax, as well as a half-page size Daytimer planner. Both have space for big picture planning and tracking daily tasks through the entire month. Here's what January's looks like filled out and with the first few days of the month tracked. When I showed this to my husband he cracked up at that "Up by 6am" goal. I am the queen of smacking the snooze button multiple times and staying in bed until the last possible moment, but I'm determined to break that bad habit this year! 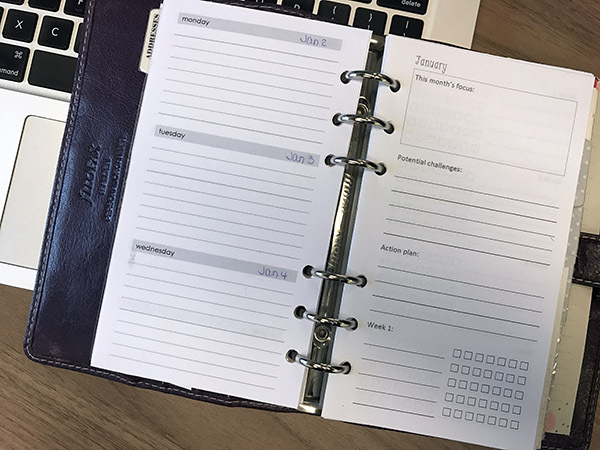 Print the pages out at 100% with your printer set to print on both sides of the page with short edge binding, and you'll get the goal overview and the first week of tracking on the front of the pages and the remaining weeks of the month on the back. 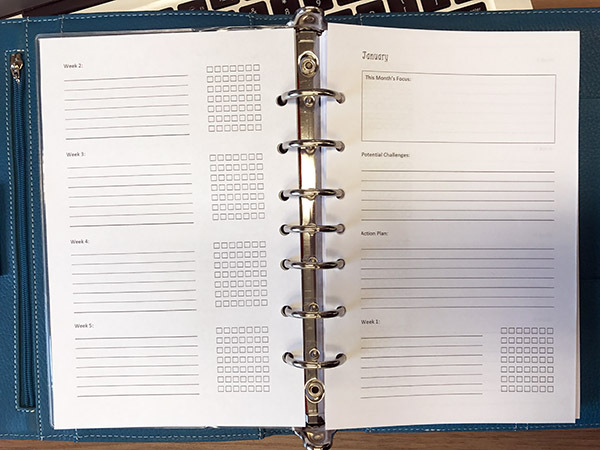 For the half page size, just cut the printouts in half and punch to fit your favorite printer. For the personal planner size, cut along the guidelines (they'll only print on one side of each page) and punch, and you'll be good to go. Here's to accomplishing big things this year!